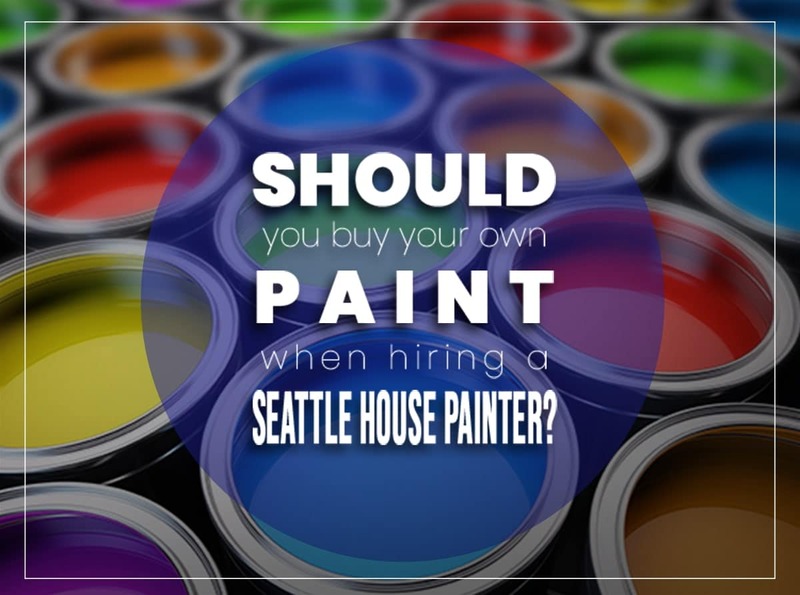 Should I Buy My Own Paint When Hiring a Seattle Painting Contractor? Hiring the best House Painter: Should I Buy My Own Paint When Hiring a Seattle Painting Contractor? Congratulations, you’ve made the decision to paint your Seattle home! You’ve chosen a Seattle painting contractor, you’ve decided on the color scheme. Now you just need to buy the paint. Many homeowners take it upon themselves to buy the paint for their remodeling project, but this may not always be the best decision. A lot of times it is better to let your Seattle painting contractor choose the paint. This won’t be the first time that your Seattle house painter has painted a house, but it might be the first time you have had your home painted. Who, then, is better placed to handle the entire project? Your Seattle painting contractor, right? Not only is your Seattle painting contractor better place to handle the entire project, your Seattle painting contractor will also prefer it. A study of contractors found that 96% of contractors would prefer full control of the pain supply for a variety of reasons. There are dozens of different paint types and brands out there and so it’s not a given that your Seattle painting contractor will be familiar with the type of pain that you buy. This isn’t to say that your Seattle house painter is inexperienced, far from it. Different paint products have to be applied differently. Some, for instance, might need a special primer before the first coat is applied. So while you may be able to get a great deal on paint, it may not be the right paint for the job or the right paint for the Seattle painting contractor. Seattle painting contractors will usually have an established network of suppliers from whom they get materials for projects. And since your Seattle painting contractor has tried specific paint products, they can attest to its quality in relation to the type of surface to be painted. Professional Seattle house painters know what is best: from the odor, color, consistency, and brand. This is where the expertise of a Seattle painting contractor is priceless. You wouldn’t choose your own exhaust when your car is being repaired, for instance. So why would you choose your own paint? Buy substandard paint and your Seattle house painter may have to buy new, better quality paint. This isn’t just an added expense, it is also time-consuming and can delay your project. You may think you can get a good deal on paint, but in reality, your Seattle painting contractor can probably get a much, much better deal—and they can pass the savings on to you. A Seattle painting contractor can leverage wholesale and trade pricing options from suppliers to get paint at the lowest possible price. This is one of the biggest but little-known advantages of letting your Seattle painting company by painting supplies. It’s simply not a case of your Seattle house painter heading to Costco like a DIYer. You don’t have access to these prices and if you don’t let your Seattle painting contractor or Seattle house painter buy the paint then you’ll be missing out. When you interfere in the process, you can potentially change the expected outcome. All the before and after case studies that your Seattle painting contractor or Seattle house painter showed you prior to agreeing on the work were probably based on them having full control over the product and the process. If you try to have the Seattle painting contractor or Seattle house painter use your own paint, therefore, you can impact the finished project. If the paint you buy isn’t the right type or quality, it doesn’t matter how good the Seattle house painter is, the result may not marry up to the expectations that you had at the outset. By letting the Seattle painting contractor or Seattle house painter supply their own paint, however, you ensure that they have no excuse not to deliver what they have promised. In doing so, you also have recourse to take action later if you are not happy with the finished product and your Seattle painting contractor or Seattle house painter cannot blame you for the result. Letting your Seattle painting contractor or Seattle house painter purchase the paint for you is a win-win situation. You save time and resources and the painters have an easier time executing the project. It also starts the painter-client relationship off on the best foot. There’s nothing worse than having a disagreement over paint at the very start of the project when it could have been avoided completely by letting the Seattle house painter buy their own paint. So there you have it, it’s almost always best to let your Seattle house painter buy the paint themselves. If you’re still looking for a Seattle painting contractor or a Seattle house painter, don’t hesitate to get in touch with the team here at Tera Painting. We offer free quotes on all projects and we’ll always make sure we get the best paint at the best possible price!